CHICAGO – Not all great works of literature make great works of film. David Mitchell’s “Cloud Atlas” is a masterpiece but Tom Tykwer, Andy & Lana Wachowksi’s “Cloud Atlas” is definitely not. It is an ambitious work with many of Mitchell’s fascinating ideas about the ripple effect of emotion through time left intact but it is a work that frustrates as often as it thrills. Too much of what unspools in this epic experience is technically remarkable and thematically engaging to dismiss the film entirely but it’s an undeniable disappointment in comparison to the work that inspired it. Mitchell’s book is a Russian nesting doll of ideas – six short stories written in different genres and set in different time periods. The first half of each story is presented to the reader and then the second half in snake order – 1-6 and then 6-1. As the book reaches its ending and all of the stories have been intertwined, the true power of Mitchell’s work resonates. The film works in the opposite direction in that the Wachowskis and Tykwer put all their cards on the table from montage one. We see all six stories in the opening scenes of “Cloud Atlas” and are instantly told – “All of these people are at the very least thematically intertwined.” From the beginning, the film version of “Cloud Atlas” is connecting dots for you in a way that Mitchell allowed you to connect on your own. And that significant flaw of the film will only become more pronounced as it goes along. Every theme is underlined, highlighted, and bolded to the point that the work never sweeps you away organically as great epics do. Six stories might lead some directors to find dozens of high-profile actors but in keeping with the themes of Mitchell’s work, the team behind “Cloud Atlas” chose to use primarily the same players across each of the arcs. 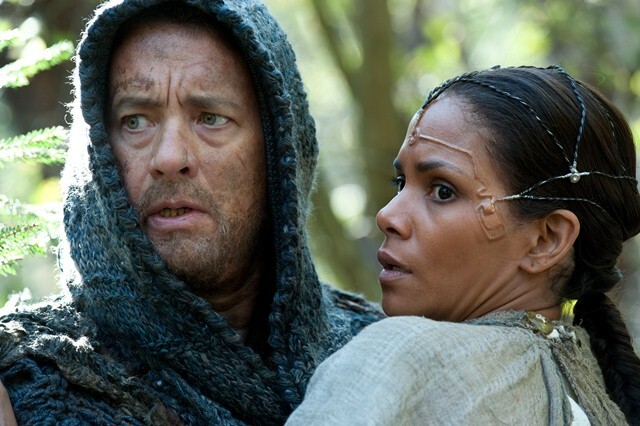 So, Tom Hanks plays a character in each time period/story, as do Halle Berry, Jim Sturgess, Jim Broadbent, etc. It’s a daring move that works on a very basic level but also somewhat plays into the main problem with the film – “See! They’re all related to each other! We’re all living the same human experience! Tom Hanks in different makeup makes that clear!” It’s letting makeup work (some of which is good but some of which is truly awful) do the thematic highlighting for you. The basic outlines of the six stories in “Cloud Atlas” are as follows. A young man (Sturgess) exploring the South Pacific in 1849 becomes a target of a cruel doctor (Hanks) and befriends a runaway slave as he struggles to survive long enough to get home to his true love. 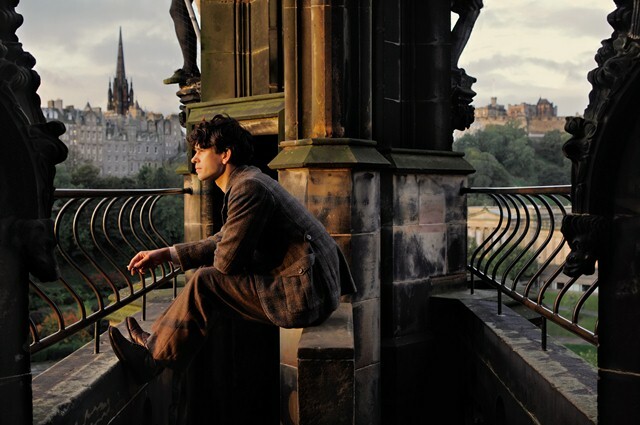 In 1936, a talented composer (Ben Whishaw) works with a music legend (Broadbent) while maintaining a series of letters with his true love. A journalist (Berry) investigates the criminal dealings of a major corporation and risks her own safety in the process in 1973. In present day, a publisher (Broadbent) is committed by his nefarious brother (Hugh Grant) and forced to deal with a sadistic nurse (Hugo Weaving). Way in the future, a clone (Doona Bae) becomes self-aware and leads a revolution. And, way, WAY in the future, a villager (Hanks) works with a traveler (Berry) to possibly save humanity. “Cloud Atlas” is dense with theme and symbolism. We need other people to move successfully through life in both 1849 and 2144. Love pushes creativity. The issues that drive humanity in one century will continue to do so for centuries to come. These aren’t exactly landmark, breakthrough ideas but the way that they’re presented in Mitchell’s book make them feel new again. And there are times in the film in which they resonate again. Writing theme instead of character or plot makes a hurried film, intent on teaching you its next lesson and tying together its next set of characters. And yet I’m conflicted. We see so many films that are completely bereft of anything interesting thematically that it seems a bit self-defeating to slam a film for being overloaded with ideas. We need to encourage Hollywood studios to make films as ambitious as “Cloud Atlas” or all we’ll get is “Alex Cross” and “Paranormal Activity 18.” “Cloud Atlas” is a film that I kept wanting to love, I kept trying to overlook the mistakes and see what worked about it (to be fair, it looks great and, other than some sketchy makeup, features top-notch technical elements all around). And while I know we can’t compare all films to their source material, I couldn’t help think about how the book swept me away on a wave of emotions, themes, and ideas that felt organic instead of that I felt were being forced on me. It comes down to this — “Cloud Atlas” is a book that possibly never could have worked as a film. So should we give the Wachowskis and Tykwer credit for trying at all? I do believe they made some smart choices but they also could have done a number of things differently. So, while they undeniably swung for the fences, to use a critical cliche about works this ambitious, they also undeniably didn’t hit a home run. As much as I hope they take another ambitious swing in the near future, I can’t help but be disappointed by their inability to connect here. “Cloud Atlas” stars Tom Hanks, Halle Berry, Jim Broadbent, Hugo Weaving, Jim Sturgess, Doona Bae, Ben Whishaw, Keith David, and James D’Arcy. It was written & directed by Tom Tykwer, Andy & Lana Wachowski. It will be released on October 26, 2012.